I filed a Chapter 13 bankruptcy petition yesterday, late in the afternoon. I filed in California on my own, without an attorney. A foreclosure sale is set for tomorrow. After I got my bankruptcy case number I tried to contact the parties involved in the foreclosure to give them notice of my bankruptcy filing. I couldn’t reach anyone in the lender’s foreclosure office, nor can I find an email address or a fax number to notify anyone to stop the foreclosure. What should I do? If you act quickly, you might be able to prevent the sale from going through. Even if the sale occurs, it’s possible you can void it (but it won’t be easy). Here’s what to do. You should attend the actual foreclosure sale, or send a reliable person to the sale. Get there early and provide proof of the bankruptcy filing to the auctioneer before the sale starts. If you can’t attend the foreclosure sale, immediately record a Notice of Bankruptcy in the county recorder’s office. Do this in the county where the real estate is located. 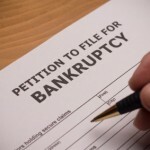 Will the Bankruptcy Stop the Foreclosure? Even so, it can get awfully tricky. Doubly so if the sale is conducted and the property gets purchased by an innocent buyer – what we lawyers call a BFP (“bona fide purchaser for value”). Even if the sale has already been held, it is very helpful to record a bankruptcy notice before a trustee’s deed is recorded. The trustee’s deed upon sale is typically not issued to the successful bidder until a few days after the sale. The recorded notice imposes what we lawyers call “constructive notice” upon all the parties involved. Constructive notice of the sale should remove any defenses that a BFP would raise if you have to bring a legal action seeking to void the sale. Of course, you should continue efforts to notify the lenders and the foreclosure agents.